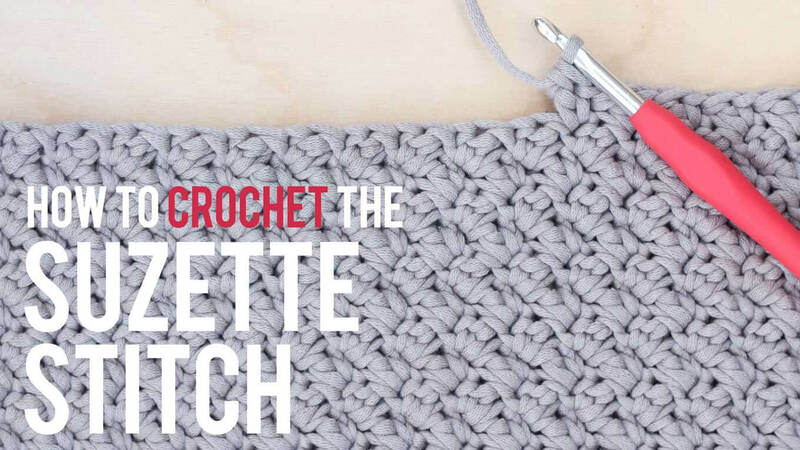 I’ve been attempting to learn new interesting crochet stitches lately and this is one that is definitely worth taking the time to figure out. 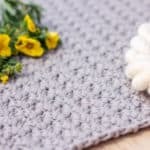 The side saddle crochet stitch is simply a combination of single crochets, double crochets and chains, yet it looks so unique. It has a beautiful, geometric pattern when viewed straight on, but the texture that appears from the side angle is what I really love. I will say that at first, the side saddle crochet stitch requires a bit of concentration. 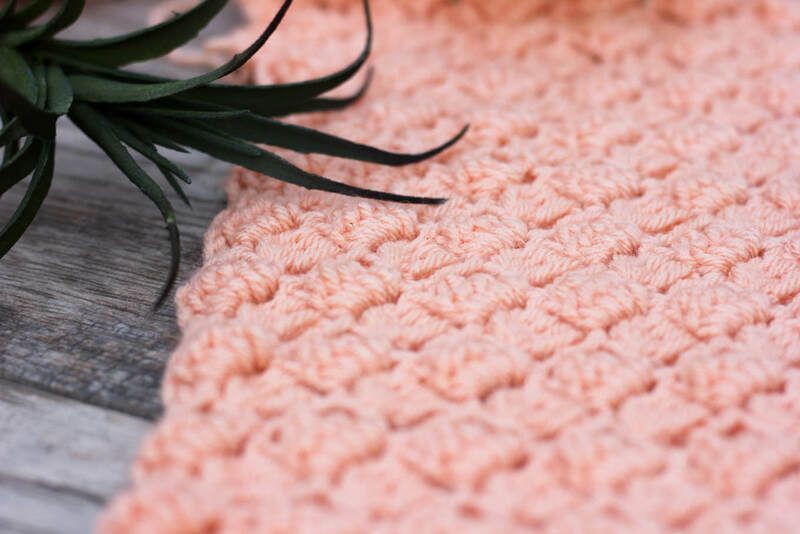 The repeat pattern is not quite as straightforward as the Suzette stitch or the moss stitch, but I explain the “logic” of the repetition in the video, so hopefully once you internalize that, you’ll be able to repeat it with no problem. This stitch is worked in multiples of 5 + 1 (add 1 more for base chain). Row 1: sc in 2nd ch from the hook, *3 ch, dc4tog over next 4 ch, 1 ch, 1 sc into next ch; rep from * to end; turn. Row 2: 5 ch, 1 sc into first cluster, *3 ch, dc4tog all into next ch 3 gap, 1 ch, 1 sc into next cluster; rep from * ending with 3 ch, dc4tog all into the ch 3 gap, 1 dc into last sc, sk turning chain; turn. Row 3: 1 ch, sk 1 st, 1 sc into next cluster, *3 ch, dc4tog into next ch 3 gap, 1 ch, 1 sc into next cluster; rep from * ending last rep with 1 sc into turning chain; turn. Thanks so much for an easy to follow informative tutorial! A pattern for a tee jumper for adults using this side saddle stitch and 4 ply yarn would finish things off nicely! I agree! That’s a great idea, Joan. I’m happy your found the tutorial helpful! Where can I find the video instructions for the side saddle please? Where do I find the “moderation”? The video is above this comment area. The written instructions for the side saddle stitch can be found right below that. Is that what you’re asking about? So to make this into an afghan I am using multiples of 5 plus 1, correct? 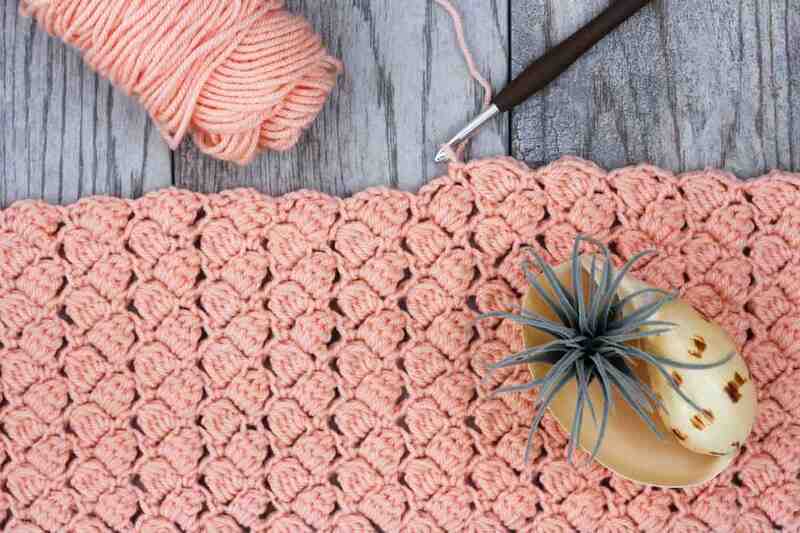 How many stitches did you do for your base chain for the example afghan? My afghan (which is pretty small because it’s for my 3-year-old) is 122 stitches across for the base chain. Thanks for all the instructions. What kind of yarn and needle did you use? Love the color!!! Hi, what yarn are you using? I love the colour! 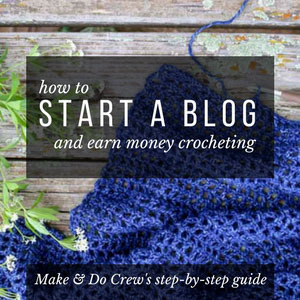 How many skeins did you use for the blanket? The yarn is “I Love This Yarn” from Hobby Lobby. I think the color is called light peach. I am actually doing a sampler blanket with different colors and stitches, so I’m not quite sure on the amount yet. I do love this yarn though because it’s really affordable, soft and easy to work with. 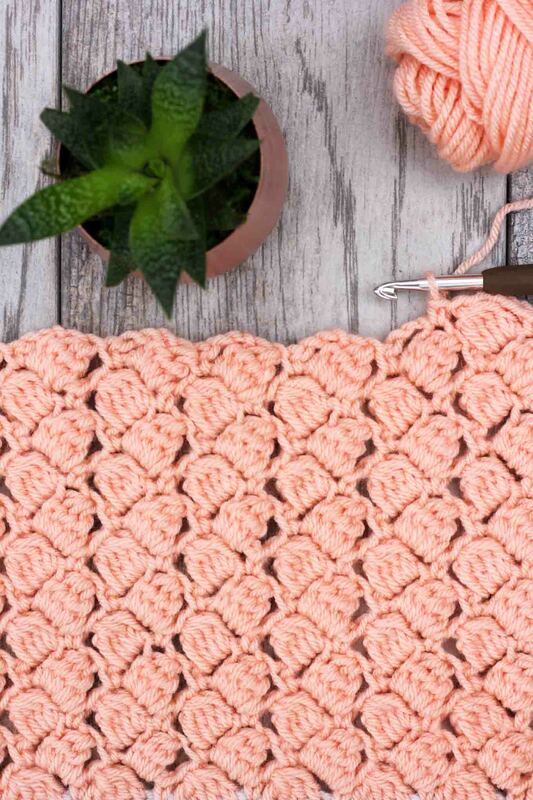 Thank you so much for sharing these simple crochet stitches that look so beautiful,. 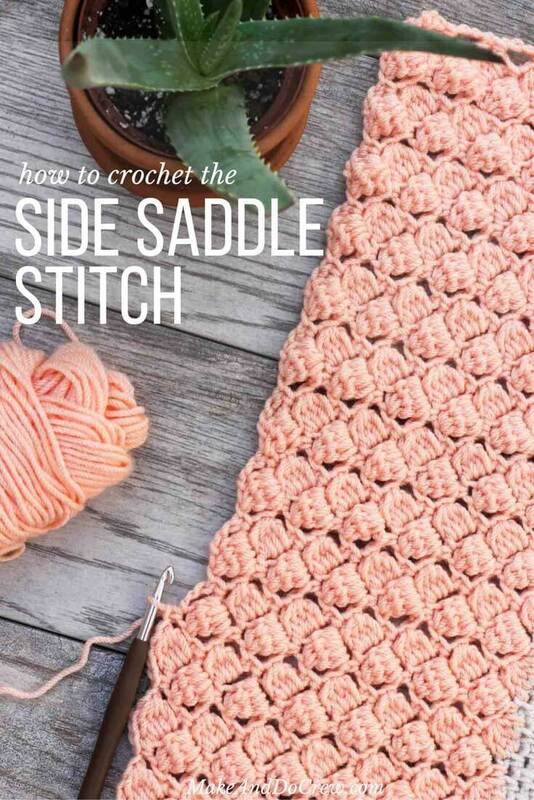 I will certainly do both the Suzette stitch and the Side saddle stitch. I am really looking forward to my finish project to see how gorgeous it is to the non crocheter and to myself. It’s my pleasure, Claire. Thank you for your kind words. It’s so fun to learn a new stitch isn’t it? 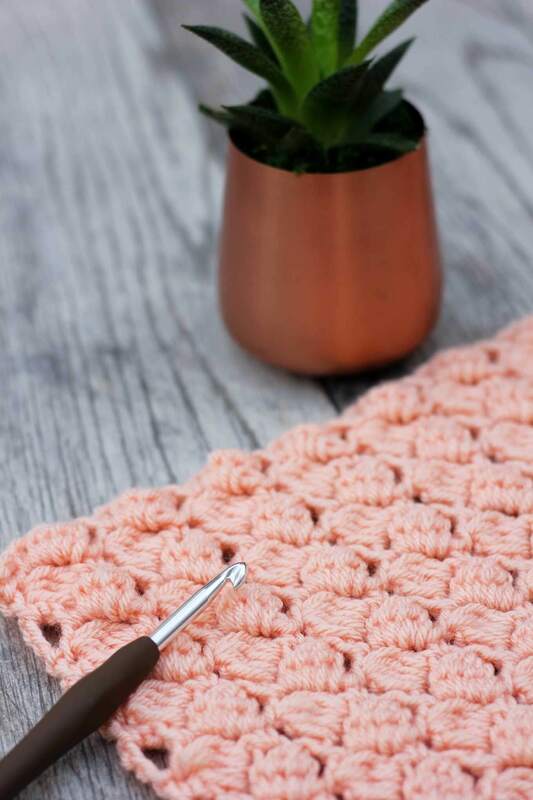 I love how different crochet can look depending on the combo of stitches you use. 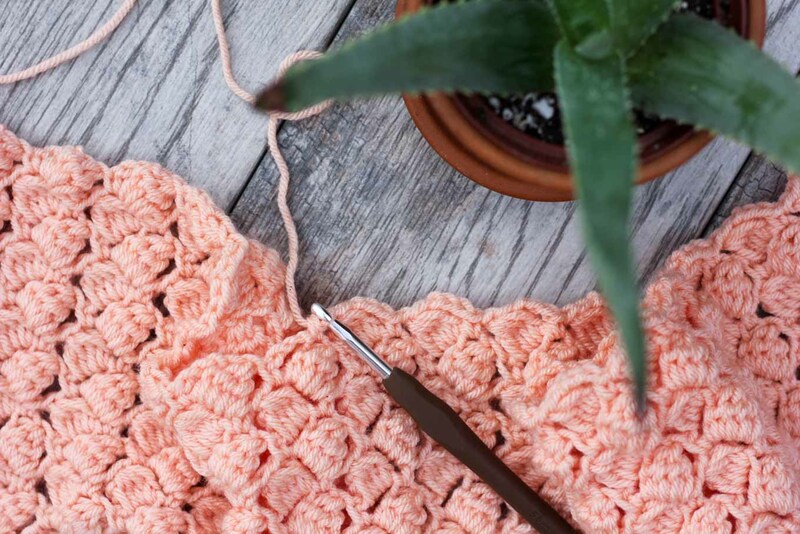 For this stitch, you’ll want to start with multiples of 5 stitches and then add 2 to that number. So it depends on the size you want and the thickness of your yarn, etc, but you can just chain any number of stitches that fit that criteria. (So like, 37, 52, 67, etc). I’d love to see your blanket when you finish! I think this will be a lovely stitch for a baby. My great grandmother made an adult size afghan for my mother with this stitch (I’ve been looking for it for YEARS) and I’m thinking of making her a new one for her birthday- do you have any idea how much yarn would be needed? I just really want to make sure I get enough- but don’t want to drown in extra. Can you please tell me how I can get the book? Will it eventually be available in ebook format (particularly for Kindle)? Thank you! Hmm. I hadn’t thought of that, Cindy. What would you like to have in an eBook format? Specific tutorials? Patterns? I’d love to know. Thanks for opening my eyes to a new possibility for how I could share my patterns and tutorials! 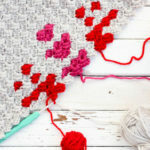 I’m also interested in throw size afghan – the link http://amzn.to/2iLCD brought me right back to this same page that i found the information in. For throw size: how many stiches to cast on,? and is there an appropriate edging when finished? So to make an afghan, you’ll want to have a multiple of 6 and then add 1 more for the foundation chain. 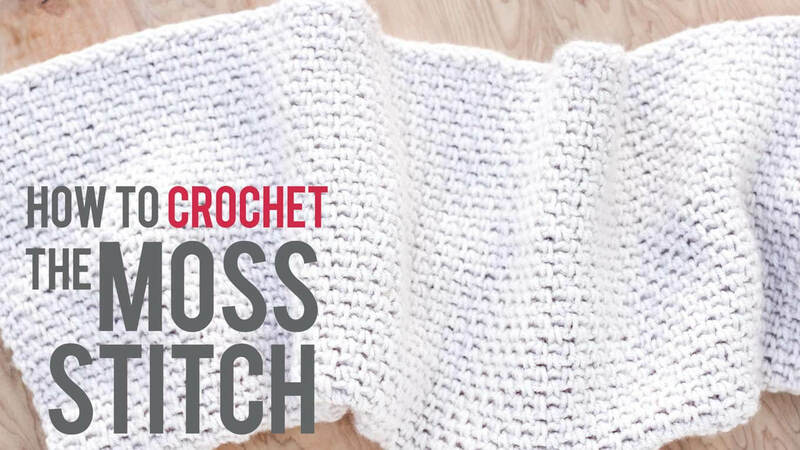 If I were you, I’d chain a bunch of stitches until I had about the width I’d like the afghan to be and then just make sure you fine tune it to have a number of chains that is divisible by 6. Then add one more stitch for the foundation chain. PS. For edgings, I love to look on Pinterest for ideas. There are a ton of great tutorials! Loved this pattern. Thank you! Just a small note, I noticed a small error in the written pattern. On row two, the chain 1 just before the last DC at the end of row is missing. Thanks so much for pointing that out, Cat! I’ll correct the written pattern right now. I appreciate your eagle eyes!